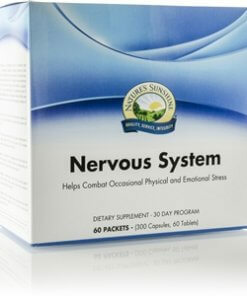 Nature’s Sunshine Nervous System Pack is a 30 day program to calm and relax the body, reducing stress and providing a regenerative sleep. 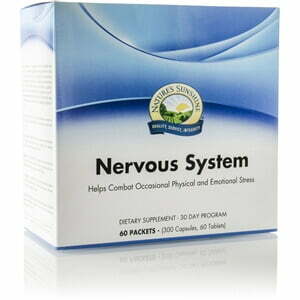 A powerful blend of four calmative herbs known to help support proper nervous system function. This unique formula promotes relaxation and well-being. This combination of adaptogenic herbs helps the body combat and adapt to stressful situations, including stress on the immune system, fatigue, and stress-related aging. This combination of eight herbs helps support proper nervous system function, reduce cellular stress, promote sleep, and provide digestive support. Provides B-complex vitamins, antioxidants, and other essential nutrients that support and calm the nervous system and encourage restful sleep. Instructions: Each day take the contents of one packet in the morning with breakfast, and the contents of one packet in the evening with a meal.